The Pyramid of Djoser (or Djeser and Zoser), or Step Pyramid (kbhw-ntrw in Egyptian) is an archeological remain in the Saqqara necropolis, Egypt, northwest of the city of Memphis. The earliest colossal stone building in Egypt, it was built in the 27th century BC during the Third Dynasty for the burial of Pharaoh Djoser by his vizier, Imhotep. The pyramid is the central feature of a vast mortuary complex in an enormous courtyard surrounded by ceremonial structures and decoration. The pyramid went though several revisions and redevelopments of the original plan. The pyramid originally stood 62.5 metres (205 ft) tall, with a base of 109 m × 121 m (358 ft × 397 ft) and was clad in polished white limestone. The step pyramid (or proto-pyramid) is considered to be the earliest large-scale cut stone construction, although the nearby enclosure of Gisr el-Mudir predates the complex, and the South American pyramids at Caral are contemporary. Djoser was the first or second king of the 3rd Dynasty (c. 2667–2648 BC) of the Egyptian Old Kingdom (c. 2686–2125 BC). He is believed to have ruled for 19 years or, if the 19 years were biennial taxation years, 38 years. He reigned long enough to allow the grandiose plan for his pyramid to be realized in his lifetime. Djoser is best known for his innovative tomb, which dominates the Saqqara landscape. In this tomb he is referred to by his Horus name Netjeriykhet; Djoser is a name given by New Kingdom visitors thousands of years later. Djoser's step pyramid is astounding in its departure from previous architecture. It sets several important precedents, perhaps the most important of which is its status as the first monumental structure made of stone. The social implications of such a large and carefully sculpted stone structure are staggering. The process of building such a structure would be far more labor-intensive than previous monuments of mud-brick. This suggests that the state, and therefore the royal government had a new level of control of resources, both material and human. 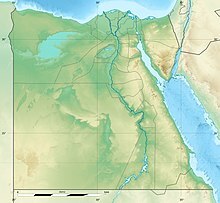 Also, from this point on, kings of the Old Kingdom are buried in the North, rather than at Abydos. Although the plan of Djoser's pyramid complex is different than later complexes, many elements persist and the step pyramid sets the stage for later pyramids of the 4th, 5th, and 6th Dynasties, including the great pyramids of Giza. Another intriguing first is the identification of the architect of the project, Imhotep, who is credited with the design and construction of the complex. Djoser's Pyramid draws ideas from several precedents. The most relevant precedent is found at Saqqara mastaba 3038 (c. 2700 BC). The substructure lay in a 4 m-deep rectangular pit, and had mudbrick walls rising to 6 m. Three sides were extended and built out to create eight shallow steps rising at an angle of 49°. This would have been an elongated step pyramid if the remaining side had not been left uncovered. In another parallel to Djoser's complex, to complete this mastaba complex a niched enclosure wall was erected. Comparison of approximate profiles of the Pyramid of Djoser with some notable pyramidal or near-pyramidal buildings. Dotted lines indicate original heights, where data are available. In its SVG file, hover over a pyramid to highlight and click for its article. Entry hall. 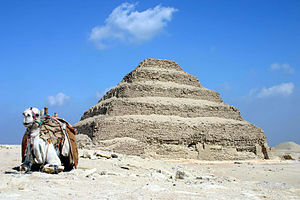 Step Pyramid Complex, Saqqara. Temples of the festival complex. Djoser's Step Pyramid complex has several structures pivotal to its function in both life and the afterlife. Several are discussed below with attention paid to function and form. The pyramid was not simply a grave in ancient Egypt. Its purpose was to facilitate a successful afterlife for the king so that he could be eternally reborn. The symbolism of the step pyramid form, which did not survive the 3rd Dynasty, is unknown, but it has been suggested that it may be a monumental symbol of the crown, especially the royal mortuary cult, since seven small step pyramids (not tombs) were built in the provinces. Another well accepted theory is that it facilitated the king's ascension to join the eternal North Star. The main excavator of the Step Pyramid was Jean-Philippe Lauer, a French architect who reconstructed key portions of the complex. The complex covers 15 ha and is about 2.5 times as large as the Old Kingdom town of Heirakonpolis. Several features of the complex differ from those of later Old Kingdom pyramids. The pyramid temple is situated at the north side of the pyramid, whereas in later pyramids it is on the east side. Also, the Djoser complex is built on a North-South axis whereas later complexes utilize an East-West axis. Furthermore, the Djoser complex has one niched enclosure wall, whereas later pyramids have two enclosure walls with the outside one being smooth and the inside one sometimes niched. The Djoser complex is surrounded by a wall of light Tura limestone 10.5 m high. The wall design recalls the appearance of 1st Dynasty tombs, with the distinctive paneled construction known as the palace façade, which imitates bound bundles of reeds. The overall structure imitates mudbrick. The wall is interrupted by 14 doors, but only one entrance, in the south corner of the east façade, is functional for the living. This arrangement resembles Early Dynastic funerary enclosures at Abydos in which the entrance was on the east side. The remaining doors are known as false doors, and were meant for the king's use in the afterlife. They functioned as portals through which the king's ka could pass between life and the afterlife. The functional door at the southeast end of the complex leads to a narrow passageway that connects to the roofed colonnade. Outside the enclosure wall, Djoser's complex is completely surrounded by a trench dug in the underlying rock. The trench measures 750 m long and 40 m wide and is a rectangle on a North-South axis. The walls of the trench were originally decorated with niches and its function seems to have been to make entry into the complex more difficult. Roofed colonnade corridor leading into the complex, with stone pillars carved to imitate bundled plant stems. The roofed colonnade led from the enclosure wall to the south of the complex. A passageway with a limestone ceiling constructed to look as though it was made from whole tree trunks led to a massive stone imitation of two open doors. Beyond this portal was a hall with twenty pairs of limestone columns composed of drum shaped segments built to look like bundles of plant stems and reaching a height of 6.6 m. The columns were not free-standing, but were attached to the wall by masonry projections. Between the columns on both sides of the hall were small chambers, which some Egyptologists propose may have been for each of the provinces of Upper and Lower Egypt. At the end of the colonnade was the transverse hypostyle room with eight columns connected in pairs by blocks of limestone. This led to the South Court. The South Court is a large court between the South Tomb and the pyramid. Within the court are curved stones thought to be territorial markers associated with the Heb-sed festival, an important ritual completed by Egyptian kings (typically after 30 years on the throne) to renew their powers. These would have allowed Djoser to claim control over all of Egypt, while its presence in the funerary complex would allow Djoser to continue to benefit from the ritual in the afterlife. At the southern end of the court was a platform approached by steps. It has been suggested that this was a platform for the double throne. This fits into the theory proposed by Barry Kemp, and generally accepted by many, that suggests the whole step pyramid complex symbolizes the royal palace enclosure and allows the king to eternally perform the rituals associated with kingship. At the very south of the South Court lay the South Tomb. 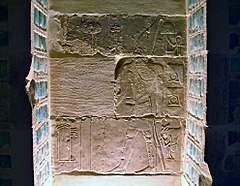 Relief of Djoser facing the temple of Horus of Behedet (modern Edfu) in a blue faience chamber of the south tomb. The South Tomb has been likened to the satellite pyramids of later Dynasties, and has been proposed to house the ka in the afterlife. Another proposal is that it may have held the canopic jar with the king's organs, but this does not follow later trends where the canopic jar is found in the same place as the body. These proposals stem from the fact that the granite burial vault is much too small to have facilitated an actual burial. The substructure of the South Tomb is entered through a tunnel-like corridor with a staircase that descends about 30 m before opening up into the pink granite burial chamber. The staircase then continues east and leads to a gallery that imitates the blue chambers below the step pyramid. Current evidence suggests that the South Tomb was finished before the pyramid. The symbolic king's inner palace, decorated in blue faience, is much more complete than that of the pyramid. Three chambers of this substructure are decorated in blue faience to imitate reed-mat facades, just like the pyramid. One room is decorated with three finely niche reliefs of the king, one depicting him running the Heb-sed. Importantly, Egyptian builders chose to employ their most skilled artisans and depict their finest art in the darkest, most inaccessible place in the complex. This highlights the fact that this impressive craftsmanship was not meant for the benefit of the living but was meant to ensure the king had all the tools necessary for a successful afterlife. The superstructure of the Step Pyramid is six steps and was built in six stages, as might be expected with an experimental structure. The pyramid began as a square mastaba (this designation as a mastaba is contended for several reasons) (M1) which was gradually enlarged, first evenly on all four sides (M2) and later just on the east side (M3). 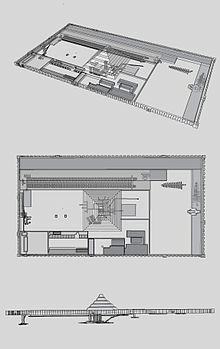 The mastaba was built up in two stages, first to form a four-stepped structure (P1) and then to form a six-stepped structure (P2), which now had a rectangular base on an east–west axis. 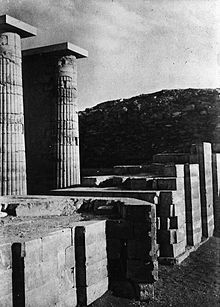 The fact that the initial mastaba was square has led many to believe that the monument was never meant to be a mastaba, as no other known mastabas had ever been square. When the builders began to transform the mastaba into the four step pyramid, they made a major shift in construction. Like in the construction of the mastaba, they built a crude core of rough stones and then cased them in fine limestone with packing in between. The major difference is that in mastaba construction they laid horizontal courses, but for the pyramid layers, they built in accretion layers that leaned inwards, while using blocks that were both bigger and higher quality. Much of the rock for the pyramid was likely quarried from the construction of the great trench. It is widely accepted that ramps would have been used to raise heavy stone to construct the pyramid, and many plausible models have been suggested. For transport, apparatuses like rollers were used in which the heavy stone could be placed and then rolled. Under the step pyramid is a labyrinth of tunneled chambers and galleries that total nearly 6 km in length and connect to a central shaft 7 m square and 28 m deep. These spaces provide room for the king's burial, the burial of family members, and the storage of goods and offerings. The entrance to the 28 m shaft was built on the north side of the pyramid, a trend that would remain throughout the Old Kingdom. The sides of the underground passages are limestone inlaid with blue faience tile to replicate reed matting. These "palace façade" walls are further decorated by panels decorated in low relief that show the king participating in the Heb-sed. Together these chambers constitute the funerary apartment that mimicked the palace and would serve as the living place of the royal ka. On the east side of the pyramid eleven shafts 32 m deep were constructed and annexed to horizontal tunnels for the royal harem. (The existence of this "harem" is debated.) These were incorporated into the pre-existing substructure as it expanded eastward. In the storerooms along here over 40,000 stone vessels were found, many of which predate Djoser. These would have served Djoser's visceral needs in the afterlife. An extensive network of underground galleries was located to the north, west and south of the central burial chamber and crude horizontal magazines were carved into these. The burial chamber was a vault constructed of four courses of well-dressed granite. It had one opening, which was sealed with a 3.5 ton block after the burial. No body was recovered as the tomb had been extensively robbed. Lauer believes that a burial chamber of alabaster existed before the one of granite. He found interesting evidence of limestone blocks with five pointed stars in low relief that were likely on the ceiling, indicating the first occurrence of what would become a tradition. The king sought to associate himself with the eternal North Stars that never set so as to ensure his rebirth and eternity. The northern (funerary/mortuary) temple was on the north side of the pyramid and faced the north stars, which the king wished to join in eternity. This structure provided a place in which the daily rituals and offerings to the dead could be performed, and was the cult center for the king. To the east of the temple is the serdab, which is a small enclosed structure that housed the ka statue. The king's ka inhabited the ka statue, in order to benefit from daily ceremonies like the opening of the mouth, a ceremony that allowed him to breathe and eat, and the burning of incense. He witnessed these ceremonies through two small eye holes cut in the north wall of the serdab. This temple appeared on the north side of the pyramid throughout the Third Dynasty, as the king wished to go north to become one of the eternal stars in the North Sky that never set. In the Fourth Dynasty, when there was a religious shift to an emphasis on rebirth and eternity achieved through the sun, the temple was moved to the east side of the pyramid, where the sun rises, so that through association the king may be reborn every day. The Heb-sed court is rectangular and parallel to the South Courtyard. It was meant to provide a space in which the king could perform the Heb-sed ritual in the afterlife. Flanking the east and west sides of the court are the remains of two groups of chapels, many of which are dummy buildings, of three different architectural styles. At the north and south ends there are three chapels with flat roofs and no columns. The remaining chapels on the west side are decorated with fluted columns and capitals flanked by leaves. Each of the chapels has a sanctuary accessed by a roofless passage with walls that depict false doors and latches. Some of these buildings have niches for statues. Egyptologists believe that these buildings were related to the important double coronation of the king during the Heb-sed. Wikimedia Commons has media related to Pyramid of Djoser. Wikimedia Commons has media related to Step pyramid complex of Djoser. ^ a b Shaw, Ian, ed. (2000). The Oxford History of Ancient Egypt. Oxford University Press. p. 480. ISBN 0-19-815034-2. ^ a b Verner 2001d, p. 461. ^ a b Lehner 2008, p. 17. ^ Hawkes, Jacquetta (1974). Atlas of Ancient Archaeology. McGraw-Hill Book Company. p. 149. ISBN 0-07-027293-X. ^ Verner 2001d, pp. 108–109 & 461. ^ Lehner, Mark (1997). The Complete Pyramids. New York: Thames and Hudson. p. 84. ISBN 978-0-500-05084-2. ^ a b c d George Hart, Pharaohs, and Pyramids, A Guide Through Old Kingdom Egypt (London: The Herbert Press, 1991), 57–68. ^ a b c d e f g h i j Kathryn A. Bard, An Introduction to the Archaeology of Ancient Egypt (Oxford: Blackwell Publishing Ltd, 2008), 128–133. ^ a b c d e f g h i j k Lehner, Mark (1997). The Complete Pyramids. New York: Thames and Hudson. pp. 80–93. ISBN 978-0-500-05084-2. ^ a b Martin Isler, Sticks, Stones, and Shadows: Building the Egyptian Pyramids (Norman: University of Oklahoma Press, 2001), 90–99. ^ a b Alberto Siliotti, Guide to the Pyramids of Egypt (New York: Barnes and Noble Books, 1997), 105–113. ^ a b c d e f A. J. Spencer, Early Egypt: The Rise of Civilization in the Nile Valley (London: British Museum Press, 1993), 98–110. ^ a b c d e Gay Robins, The Art of Ancient Egypt (Cambridge: Harvard University Press, 2000), 40–45. ^ a b c d e f g h Miroslav Verner, The Pyramids (New York: Grove Press, 1998), 105–139. ^ Dieter Arnold, Building in Egypt, Pharaonic Stone Masonry (Oxford: Oxford University Press, 1991), 79–101. This page was last edited on 28 March 2019, at 18:48 (UTC).